Simi Valley, Calif. — The U.S. military is preparing to conduct military and special operations training for Libya’s military and the training will risk including Islamist terrorists among the trainees, according to the commander of the U.S. Special Operations Command. Adm. William McRaven, the commander who helped lead the covert raid to kill al Qaeda leader Osama bin Laden, said in a brief interview Saturday that the counterterrorism training operation has not begun. "We’re in the early stages," he told the Free Beacon. McRaven said a major gun battle erupted in Tripoli last week among opposing militias, a sign of instability in the North African country. The training is needed to stabilize Libya, an oil-rich country beset by mounting terrorism and Islamist militias. During a panel discussion on the war on terrorism at the Reagan National Defense Forum, McRaven disclosed that the Libyan military training would include both conventional forces training and special operations training and that there will be risks. "We are going to have to assume some risks," McRaven said. "Right now we have the authorities to do that training, and I think as a country we have to say there is probably some risk that some of the people we will be training with do not have the most clean records, but at the end of the day it is the best solution we can find to train them to deal with their own problems." McRaven disclosed the plans for Libyan training when asked about problems encountered in training foreign special operations forces. McRaven said the training would include a "very, very thorough review" of the Libyans who will take part. Since the ouster of Muammar Gadhafi in 2011, Libya has had a weak government in a region dominated by Islamist militias ranging from al Qaeda affiliates to Islamists that do not support al Qaeda. A weak central government has resulted in the spread of militias throughout the country. Weak border controls also have made the country a safe haven for jihadists. Intelligence reports from earlier this year said some of the Islamists are engaged in training jihadists fighters who are then dispatched to Syria to join Islamist rebels there fighting the regime of Syrian President Bashir Assad. The four-star admiral said the risks have been explained to senior leaders, including Secretary of Defense Chuck Hagel, Chairman of the Joint Chiefs of Staff Gen. Martin Dempsey, and the regional combatant commanders. The U.S. covert raid to capture al Qaeda leader Anas al Libi also has led to a backlash by Islamist militias operating in Libya. The terrorists who attacked the U.S. diplomatic compound in Benghazi, killing Ambassador Christopher Stephens and three other Americans, were linked to al Qaeda. 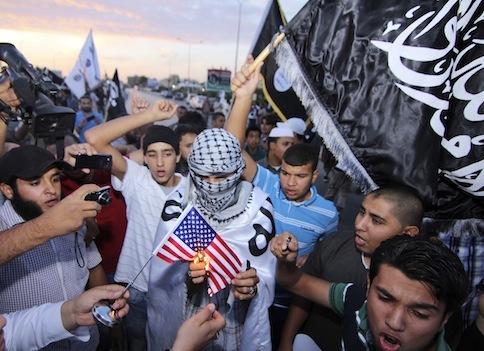 The group, Ansar al Sharia, continues to operate openly, despite promises by President Barack Obama to bring those who carried out the Sept. 11, 2012 attacks to justice. Additionally, Ansar al Sharia has grown more belligerent in recent months, apparently abandoning propaganda efforts to rebrand itself as a nonviolent militia. Libyan militias also have seized some oil production facilities and have been selling oil to fund their activities. Recently, al Qaeda terrorists reportedly infiltrated into Libya through the poorly protected southern border, according to a U.S. official. McRaven said the military and special forces training will be carried out through the U.S. Africa Command, the military command in charge of Africa, and that negotiations with the Libyans are still underway. Between 5,000 and 7,000 Libyans will receive conventional military training from the United States. "And we have a complementary effort on the special operations side to train a certain number of their forces to do counterterrorism," McRaven said. Special operations training for the Libyans raises the prospect that some of the most advanced military tactics and operations could be compromised to Islamists. Both training programs are being developed with Africom and supported by the U.S. Embassy in Tripoli. This entry was posted in National Security and tagged Ansar al-Sharia, Benghazi, Libya. Bookmark the permalink.